This article provides an outline of the currency of Spanish America (las Indias, the Indies) from Spanish colonization in the 15th century until Spanish American independencies in the 19th. This great realm was divided into the Viceroyalty of New Spain (capital: Mexico City), which came to include all Spanish territory north of Panama, the West Indies, Venezuela, and the Philippines, and the Viceroyalty of Peru (capital: Lima), which included Panama and all Spanish territory in South America except Venezuela. The monetary system of Spanish America, originally identical to that of Spain, soon diverged and took on a distinctive character of its own, which it passed on to the independent nations that followed after. After the Spanish kingdoms were united under Ferdinand of Aragon and Isabella of Castile and soon after the conquest of Granada, the Spanish monetary system was reformed. This caused some damage to the kingdom. The maravedí had served as the Spanish money of account since the 11th century, but on June 2, 1497 the Ordinance of Medina del Campo (site of the great international fairs) made the real the unit of account, with the maravedí defined as a fraction of it (the 34th part). The standard silver coin became the real of 3·434 g, 0·9306 fine (3·195 g silver), rated 34 maravedíes. There was also a half, a 3, and a 6-real coin. This reform adopted the excelente (called ducado from 1504) for gold, a copy of the Venetian ducat, 3·521 g, 23¾ carats fine (3484·442 mg gold), rated 375 maravedíes. A third standard coin was the blanca, a small coin of 1·198 g, worth half a maravedí. The blanca was a copper coin containing a trace of silver, a type of coin known as billon, vellón in Spanish. This was the monetary system that the Spaniards brought to the New World. The first distinctive coins minted for Spanish America were copper 4-maravedí pieces authorized for Santo Domingo by Ferdinand on December 20, 1505 (later confirmed by his daughter, Johanna, on May 10, 1531). These coins were minted in Spain (at Burgos and Seville) and shipped to Santo Domingo (Hispaniola), and subsequently also to Mexico and Panama. The first were struck 1502–1504 in the name of Ferdinand and Isabella, with an F-I monogram obverse and pillars reverse. Ferdinand died in 1516, and Johanna's son Charles became King Carlos I of Aragon and Regent of Castille, so the last coppers struck in the early 1520s had a Carlos-Johanna monogram. 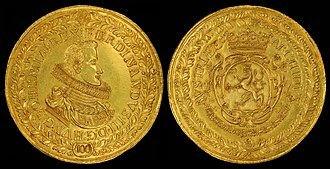 Charles, who was also Holy Roman Emperor (as Karl V), reformed the gold coinage in 1537, replacing the ducado with the escudo or corona, essentially a debased ducat. The escudo, 24 mm, 3·383 g, 0·9167 fine (3101·117 mg gold), was rated 350 mrs. The ducado was not minted after 1537 but continued as a money of account (Ducado = 375 Maravedíes), especially for foreign exchange. Charles sent silver coins to New Spain in 1523, but this was insufficient for local commerce. A sort of "coin" was produced at Mexico City: gold discs stamped with their weight and fineness and sometimes with royal countermarks. These discs are known as Tepuzque (the Aztec word for copper) gold or peso de oro. Although not strictly coins, they did serve as money and circulated as late as 1591. No examples are known to exist. Mexico City was growing and by 1525 it was petitioning the crown for a mint to produce coin locally in order to facilitate trade. This wish was granted by royal ordinance of May 11, 1535 and a mint opened and began producing silver coins at Mexico City in April 1536. The first silver struck in the Indies (Spanish America), known as the pillar type because it depicted the pillars of Hercules, were hand struck, typically on a full-sized round planchet of even thickness. Obv. : the crowned shield of Leon and Castile, quartered with castle and lion, with the pomegranate of Granada at the point of the shield, and on either side a mintmark (M for Mexico), the rim inscribed KAROLVS ET IOHANA REGES. Rev. : two crowned columns (pillars of Hercules) with PLVS (for plus ultra) on a banner and the value (dots or a number) between them, the rim continuing the inscription with HISPANIARVM ET INDIARVM. The full inscription appears only on the larger coins, becoming more abbreviated as coins size decreases. The small quarter real has a crowned initial K without mintmark obverse (instead of the shield); the half real had the initials K I and the mintmark below. The assayer's initial appears either on the reverse between the column bases (R or G), or on the obverse in place of one of the two mintmarks (P or F). Struck at Mexico City between 1536 and 1542, undated. Denominations: 1/4, 1/2, 1, 2, and 3 reales. (These coins are rare; perhaps only 300—400 specimens survive.) The 2 and 3-real coins were confused because of their similar size, so the 3 reales was discontinued in 1537. The 1/4 real was unpopular because of its small size; it was not minted after 1540. The reverse of the design was modified in 1542, when waves were placed between the two pillars and the full motto PLVS VLTRA, without a banner, appeared across the field. Struck at Mexico City (1542–1572), Santo Domingo (1542–1564), and Lima (1568–1572); undated. After Philip II ascended the throne in 1556, Mexico City continued minting type 1542 coins in the name of Charles and Johanna. Lima, however, used the inscription PHILIPVS II. 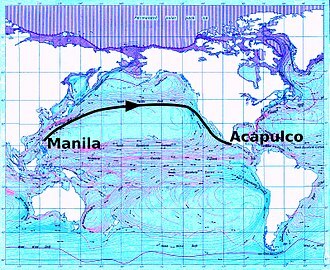 From 1565 until 1821 there was an annual galleon convoy (Galeones de Manila-Acapulco) that crossed the Pacific from Acapulco loaded with silver coin, which was exchanged at Manila in the Philippines for Oriental goods, chiefly for spices, silk, tea, porcelain, and lacquerware. The output of the American mines was usually shipped to Spain in the form of ingots or of crude, temporary coins (macuquinas or cobs). Ingots and cobs were a way to account for the 20% (royal fifth, quinto real) of all treasure due the king. The value of the escudo was raised on November 23, 1566 from 350 to 400 mrs, and multiples were introduced. The double escudo (doblón) was called a pistole in the rest of Europe and in England. The 8-escudo piece (onza de oro) was initially known as a double doubloon, then as a quadruple pistole, but eventually gained fame as the Spanish doubloon. This doubloon of 8 escudos eventually became the most common Spanish gold coin, equivalent to 16 silver pesos. The 1566 reform also provided for a silver 8-real coin, the real de a ocho or peso duro (which had already been minted in Spain in limited number). This coin, 39–40 mm, 27·468 g, containing 25·561 g pure silver, was now struck in the Indies, at Lima from 1568 and at Mexico City from 1572. This coin was commonly known in English as the piece of eight. The new coin design of 1572 (new for America, but already being minted in Spain) is known in English as the shield or the cross type. It was known in Mexico as maquina de papalote y cruz (windmill and cross money). These were hammered coins, produced quickly, and they generally deteriorated in quality throughout the period. Most cobs were soon melted down to produce coins, jewelry, etc. But many circulated as coin, but their crude appearance invited clipping, and many were soon lightweight. Obv. : the crowned Habsburg arms, with mintmark and assayer's initial left and the value right, the rim inscribed PHILIPVS II DEI GRATIA. Rev. : the quartered arms of Castile and León inside a quatrefoil design, the dividing lines emphasized, looking like a cross, the rim inscribed REX HISPANIARVM ET INDIARVM. The inscriptions are abbreviated on the smaller coins. Minor differences in design detail can be ascribed to a specific mint. Struck at Mexico City 1572–1734, Santo Domingo 1572–1578, Lima 1572–1650, La Plata 1573–1574, Potosí 1574–1650, Panama 1580–1582, Cartagena 1622–1650, and Bogotá 1622–1650. This was the first New World type to be struck in the 8-real denomination. Trade with the Far East and bullion shipments to Spain required ever greater quantities of processed silver. The demand for quantity led to ever poorer workmanship during the 17th century, so that coins were struck on crude pieces of silver. These roughly made lumps of silver, irregular in shape and thickness but of standard weight and fineness, conveniently served as temporary coins. They are known as macuquina in Spanish and as "cobs" in English. Philip III continued with the shield type of 1572 (inscribed PHILIPVS III), also in denominations of 1, 2, 4, and 8 reales. Mexico City coins were dated from 1607. Potosí, where the position of mint assayer was auctioned off to the highest bidder, only began dating coins in 1617, after a scandal involving an illegal debasement of the cob coinage (1610–1617). The dates were added to the obverse inscription, but because of the irregular shape of a cob, they are rarely legible. 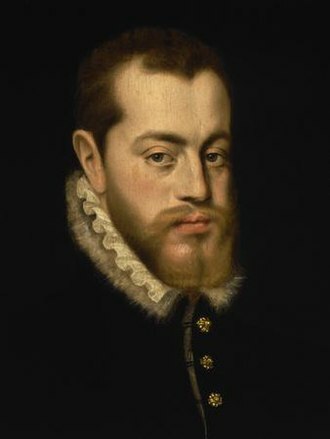 Philip III unleashed the era of vellón in Spain in 1599, when his government attempted to remain solvent by authorizing vellón of pure copper. 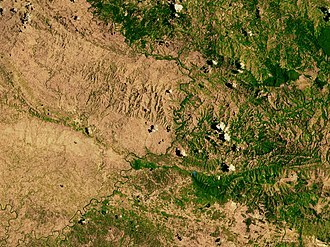 It was at this time that the flood of silver from Mexico and Peru peaked. The different kinds of coin—gold, silver, and vellón—had circulated at par since 1497, but heavy issues of vellón above its intrinsic value destroyed its customary acceptance at par, and began driving silver out of circulation. By 1620 accounts in Spain were being kept in reales of vellón, no longer in silver reales. The output of vellón in 1621–1626 was prodigious. Since 1599 over 15 billion maravedíes worth of vellón had been minted. Silver was constantly at a premium, and prices rose sharply. Then the influx of silver began declining in the 1630s as more silver was retained in America for colonial needs. Old world coin types used in early America are known from archeological evidence of coin hoards commencing at Santo Domingo, circa 1500, and onward. Most any coin used in the old world could have migrated to the new, with explorers and settlers embarking from many ports with some local change in their purses. On arrival in America the first coins were walked about, able to be found hundreds of miles away from where their owners first stepped ashore. Coin types found in abundance, such as "blancas" of the Catholic Monarchs, were likely drivers of early commerce, and not mere keepsakes of the immigrants. The first new world mint was authorized in 1536 at New Spain, Mexico City. Macuquinas, also known as "cobs", were used heavily in local transactions in America, although their poor quality produced many complaints. Water-powered roller die and punch technology, capable of making high quality, round coinage was imported to Segovia, Spain from Germany in the 1580s, yet the old Royal mint at Segovia continued to make cobs. The Potosi Mint was the last to establish this advanced technology, making cobs until 1772. The macuquina's irregular shape invited clipping, leading to ever greater numbers of coins below legal weight. Clipped coin tended to migrate at a small profit in commerce to cities in need of coin (often those preparing a fleet for sail) where hard money was accepted at, or near, face value. In 1784 (by which time all macuquinas were over a decade old), King Charles III ordered macuquina in the Indies withdrawn and reminted. The order had to be reissued in 1789, but it remained unfulfilled due to a lack of resources. Cobs are the original "treasure coins." Struck and trimmed by hand in the 16th through 18th centuries at Spanish mints in Mexico, Peru, and Colombia (among others), silver and gold cobs are handsomely crude, nearly all with a cross as the central feature on one side and either a coat-of-arms (shield) or a tic-tac-toe-like "pillars and waves" on the other side. Silver cobs are known as "reales" and gold cobs are known as "escudos,", with two 8 reales (about 27 grams each) equaling one escudo. Some cobs were struck with a date, and most show a mintmark and an initial or monogram for the assayer, the mint official who was responsible for weight and fineness. Size and shape were immaterial, which means that most cobs are far from round or uniform in thickness. Cobs were generally accepted as good currency all around the world, and were the exact coins pirates referred to as "pieces of eight" (8 reales) and "doubloons" (any gold cobs but originally 2 escudos). Their design and history have made cobs a very popular choice for jewelry. Silver coins of the 1572 type were minted with PHILIPVS IV and a 1/2-real cob was added to the usual 1, 2, 4, and 8-real denominations. There were major gold deposits in Colombia; a mint opened at Santa Fe de Bogotá in 1620, and it produced the first gold coins (cobs) in Spanish America in 1622. Unlike silver, the gold coins show the king's portrait obverse. A second illegal debasement of the cob coinage in the Viceroyalty of Peru in 1631–1648 was a major scandal. The public began refusing all Peruvian coins as potentially below standard. After this affair, the cross design was replaced at all the Peruvian mints by a new pillar-and-wave design. The reputation of coins from the Mexico City mint was unblemished, and cross type cobs continued to be produced there until 1734. Meanwhile, all Peruvian coins circulating in Spain were called to the mints in 1650 to be recoined. After the debasement scandals in Peru, cross type cobs were replaced by a type known as pillars and waves in English and as Perulera in Spanish. These hand struck cobs, like the cross type, degraded in quality as time passed. Obv. : a cross with lions and castles (similar to the 1572 reverse). Rev. : a pair of pillars with waves below intersected by three horizontal lines of text, forming a tic-tac-toe design, the top line with the mintmark, the value, and the assayer's initial (e.g. L 8 M = Lima, 8 reales, assayer M), the middle line PLVS VLTR[A] (abbreviated on the smaller coins), the bottom line the assayer's initial, the last two numerals of the year, and the mintmark (e.g. M 88 L = assayer M, 1688, Lima). Struck at the Bogotá, Potosí, Cartagena, and Lima mints from 1651 on. Even after the introduction of milled coinage in 1732, the Potosí mint continued to produce cobs of this type (the last in 1773). These cobs were generally accepted, but there were still occasional periods of debasement, and Peruvian coinage was usually considered inferior. The overissue of vellón coin in Spain had driven gold and silver from circulation. After the failure of numerous attempts to correct this situation, the currency finally underwent a major reform on October 14, 1686, when Spain devalued silver by ≈20% and adopted a dual coinage standard. The old silver standard (plata vieja) was maintained in the American colonies, but a new devalued silver (plata nueva) was adopted for circulation in Spain itself. The old piece of eight was valued at 10 reales of the new silver coin. The new 8-real coin was known as peso sencillo, the old piece of eight as peso fuerte. Foreign exchange was quoted in pesos de cambio, based on the old piece of eight, which continued to be produced in America. After this, the monetary systems of Spain and of Spanish America differed significantly. In 1675 Mexico was finally authorized to mint gold, producing its first gold cobs in December 1679, Lima minted its first gold in 1696. The silver coins of the 16th century bore an irregular row of dots near the rim, which became more regular during the 17th century as gold coins took on a rounder, standard shape. The circle of dots (cordoncillo) was placed closer to the edge. Silver coins followed the gold in adopting these improved details, but the piece of eight did not show a clear outline until 1709. Various Imperial thalers, called dollars in English, were familiar to North American colonists. The piece of eight had the same intrinsic value as the thaler and by the end of the 17th century it too was being called dollar (and was so designated in Jamaican monetary legislation of 1738). By the mid 18th century the piece of eight was commonly known in British North America as the Spanish dollar. Colloquial terms used in New Spain were: pataca for the peso (real de a ocho), tostón for the medio peso (4 reales), and peseta for the 2 reales. Gold circulation became more common in Spanish America after 1704, when the West Indies adopted a gold standard. After 1716 the Spanish mints flooded Spain with debased silver based on the real sencillo of 3·067 g, containing 2·556 g silver. These silver coins were called plata provincial. The silver minted in America was now officially called plata nacional, but was also called plata vieja (old silver) or plata gruesa (heavy silver), and occasionally plata doble (double silver). The British East India Company had established a regular trade with China by 1720, paying for goods with Spanish silver. To prevent sweating and clipping, laws of 1728 and 1730 adopted modern minting techniques. Gold and silver coins were to be perfectly round and to have milled edges. There was a reduction in weight and fineness, the peso becoming 27·064 g (the same weight as the gold onza), with 24·809 g pure silver. The onza de oro or peso duro de oro (8-escudo piece) was 27·064 g, 22 carats fine, 24,808·936 mg pure gold. The Mexico City mint was the first to comply, in 1732, using an up-to-date screw press. An edge design, resembling a tulip, was put on the 8-reales to make any clipping evident. Technical problems and local resistance to design change delayed the adoption of milled coinage at Lima and Santiago until 1751. The milled pillar type of 1732, columnario in Spanish, was machine struck on a full-sized round planchet. Obv. : the crowned arms of Castile and León, the assayer's initial left, the value right, the rim inscribed PHILIP•V•D•G•HISPAN•ET•IND•REX+. Rev. : two orbs (representing the Old and the New Worlds) under a crown and over the Straits of Gibraltar, flanked by two crowned pillars with PLUS VLTR[A] on banners wrapped around the columns, the inscription VTRAQUE VNUM, and below, the date, preceded and followed by the mintmark. The obverse shield is the usual lions, castles, and pomegranate, but with the center defaced by the Bourbon arms (three fleurs-de-lis). Some minor modifications were subsequently made in the location of the mintmark and assayer's initials. The 8-real coin, 39.5 mm, was given a protective corded edge design resembling a tulip. Produced until 1772: at Mexico from 1732, Santiago and Lima from 1751, Guatemala City from 1754, Santa Fe de Bogotá from 1759, and Potosí from 1767. During the production of these coins some minor modifications were made in the location of the mintmark and assayer's initials. The old style cobs continued to be produced in the Viceroyalty of Peru, with the last coming from the Potosí mint in 1773. Denominations: 1/2, 1, 2, 4, and 8 reales. The 8-reales produced from 1732 until 1772 was the coin that became a standard in the English colonies in North America: it is the coin referred to in colonial contracts calling for payment in Spanish milled dollars. The first milled gold was also produced in 1732 at the Mexico City mint. The production of gold cobs continued until 1750, after which time they were completely replaced by milled coinage. The gold coins feature an obverse portrait design, and the royal arms (reverse) appear smaller than on the silver coins to allow for the encircling collar of the Golden Fleece. The royal titles are the same as on the silver, but the legends vary. The 1732–1747 type bears the inscription INITIUM SAPIENTIAE TIMOR DOMINI. The debased Spanish provincial silver was supposed to remain in Spain, but it crossed the Atlantic to create problems. The 2-real coin was particularly common in the English colonies, where it was known as a pistareen. It was easily distinguished from the Spanish American silver because provincial silver had the crowned heraldic Habsburg shield obverse and cross with the Castile and León shield reverse, and were known as "cross" pistareens (and cross reales). The peso duro (dollar) was usually worth five pistareens. On May 4, 1754 Ferdinand VI prohibited the circulation in America of all money coined in Spain, including national gold and silver coins identical with those minted in America. The quantity of overvalued provincial silver in circulation was so great that colonial officials lacked the means to redeem and remove it from circulation. In 1748 the inscription on the gold coins was changed to NOMINA MAGNA SEQUOR (until 1759). Lima switched from producing gold cobs to minting milled gold in 1751. A mint opened at Santiago, Chile, in 1750, which produced chiefly gold coins. The rim inscription is FERDND•VI•D•G•HISPAN•ET•IND•REX+ obverse, and +VTRAQUE VNUM+[mintmark]+[year]+[mintmark]+ reverse. On the silver 8-real coin the royal Spanish crown on top of the left pillar was replaced in 1754 by an Imperial crown. The silver of Charles III bore the rim inscription CAROLUS•III•D•G•HISPAN•ETIND•REX+ obverse, and +VTRA QUE VNUM+(mintmark)+(year)+(mintmark)+ reverse. The 8-real piece was commonly called the Carolus dollar in English. The inscription on the gold coins of Charles III was changed to IN UTROQ FELIX AUSPICE DEO (and remained thus until the American colonies gained independence). After 1757, China restricted European trade to Canton (see Thirteen Factories for a description of this trading system). The British East India Company dominated this trade and paid for its purchases with Spanish Carolus dollars, which were accepted in China for more than the 4s:2d sterling that was considered their intrinsic value. Chinese merchants gradually became accustomed to the dependable weight and fineness of Spanish milled silver and, instead of melting the coins down, they began to use them as currency, often with a chop (seal, countermark) to guarantee its acceptability. Charles adopted new coin designs with the royal profile, more difficult to counterfeit, and his Pragmatic of May 29, 1772 ordered all money in circulation in Spain and the Indies to be recoined at the same weight and fineness, but he secretly instructed the mints to lower the fineness of national gold from 22 carats to 21⅝ and of national silver from 0·91667 to 0·90278. This gave a peso of 27·064 g with 24·433 g silver and an onza of 27·064 g with 24,386·057 mg gold. These coins are known as the "portrait" or "modified pillar" type in English, and as busto in Spanish. 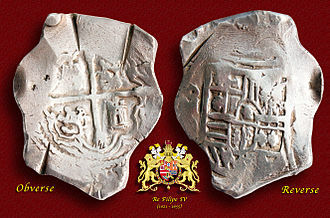 (English head real was applied to the provincial silver real coined in Spain, which was 20% lighter.) Obv. : bust of the king, the rim inscribed CAROLUS III DEI GRATIA with the date. Rev. : two columns (pillars of Hercules) with the motto PLUS VLTRA on banners, but the two orbs between the columns were replaced with the crowned shield of Leon and Castile, the rim inscribed HISPAN. ET IND. REX, then the mintmark, value, and assayer's initials. The corded (tulip) edge of the eight reales was replaced with an edge design of alternating circles and rectangles. Because of problems in supplying new dies, an edict of December 24, 1788 authorized the American mints to continue using the dies with the portrait of Charles III, while changing the name to Charles IIII by adding another Roman numeral I. New dies finally arrived in 1791. The 8 reales was struck at Potosí in 1789 and 1790 with the bust of Charles III but the name altered to "IV", then with the new portrait of Charles IV in 1791. The first cuarto (1/4 real) was struck at Mexico City in 1794. 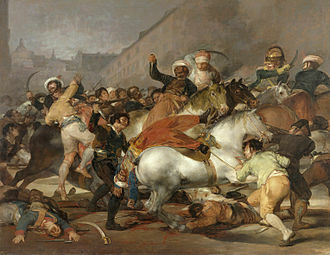 The colonies were cut off from Spain by the French occupation and the Peninsular War of 1808–1814, They were ruled by independent juntas that refused to recognize Joseph Bonaparte, proclaiming allegiance to the deposed Ferdinand VII. But the independence movement had already been initiated in earnest by Francisco de Miranda, and in 1810 it broke out in full force. The Spanish Napoleonic coinage was used only in Spain. The American mints initially minted coins with the portrait of Ferdinand VII. 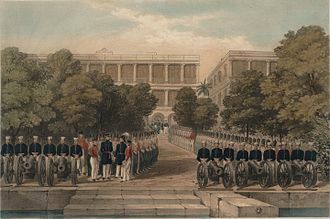 The minting of royalist coins effectively ended in 1821, when republican forces captured the mint at Lima (although republican coins were counterstamped as royalist at Lima in 1824). The monetary unit in the former Spanish colonies was the silver peso, with a value of 8 reales. Silver coins were: cuartillo (1/4 R), medio (1/2 R), real, peseta (2 R), medio peso (4 R), and peso (8 R). If minted to standard, they were either 0·916 fine or (from 1772) 0·902 fine. Circulation also included a varying quantity of macuquina, worn, and of varying weight and fineness. There were also silver coins of various types that had been produced by republicans and royalists during the struggle for independence. Gold did not circulate as common currency. It was used primarily in international trade and for hoarding, The standard coin was the gold onza, with variations in fineness, the pre-1771 coins being 0·9165 fine; the 1771 type, 0·901 fine; and the 1786 type, only 0.875 fine. Copper coins were also in circulation, having appeared in quantity during the struggles for independence. The mint standards were set by the Spanish crown and until 1686 the coinage of Spain and of the Indies (Spanish America) were identical, save in two respects. A minor difference was that coins minted in America were inscribed REX HISPANIARVM ET INDIARVM (king of the Spains and the Indies), while those minted in Spain had only REX HISPANIARVM. The major difference was that vellón or copper coins were not minted for circulation in the Spanish American colonies, while after 1602 the currency of Spain itself consisted chiefly of copper coin. Although Mexico and Peru were the chief source of the world's silver, after 1620 silver was always at a premium in Spain and vellón constituted the accounting unit and the chief medium of exchange (the cuarto also became a common accounting unit). The silver flowed through Spain in a steady stream to pay for imports, wars, and imperial expansion. Philip IV reformed Spain's monetary system in 1686 by debasing the silver coinage, which had been unchanged since 1497. This reform applied only to coins minted in Spain. The coinage of the American colonies, which had already assumed great importance in international trade, was left untouched, and the 1497 silver standard continued in use (until 1728). From this time on, the monetary systems and currencies of Spain and of Spanish America developed differently. Coins were defined by monetary regulations as so many minted per mark weight and of a certain minimum fineness. The mint mark used was the mark of Castile. It originated when Alfonso X (1252–1284) replaced the Roman pound (libra) with the Cologne mark. Spanish numismatists usually use the weight of this mark as determined in 1799, i.e. 230·0465 grams. 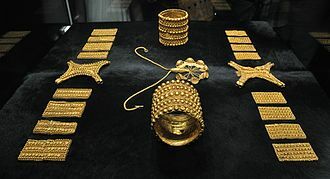 The measure of fineness (ley in Spanish) for gold was 24 quilates (carats), each of 4 granos (grains); the measure for silver was 12 dineros, each of 24 granos. ^ Shaw, W.A. (1896, reprinted 1967), The history of currency 1251 to 1894: being an account of the gold and silver moneys and monetary standards of Europe and America, together with an examination of the effects of currency and exchange phenomena on commercial and national progress and well-being, New York: G.P. Putnam's Sons, reprinted by Augustus M. Kelley, pp. 319–344, LC 67·20086 . ^ Bischoff, William, editor 1989. The Coinage of El Perú, New York: American Numismatic Society. ^ halmers, Robert (1893), History of currency in the British colonies, London: Eyre and Spottiswoode for Her Majesty's Stationery Office, pp. 5–23, 101-105, 390-396 . ^ Shaw, W.A. (1896, reprinted 1967), The history of currency 1251 to 1894: being an account of the gold nio and silver moneys and monetary standards of Europe and America, together with an examination of the effects of currency and exchange phenomena on commercial and national progress and well-being, New York: G.P. Putnam's Sons, reprinted by Augustus M. Kelley, pp. 319–344, LC 67·20086. 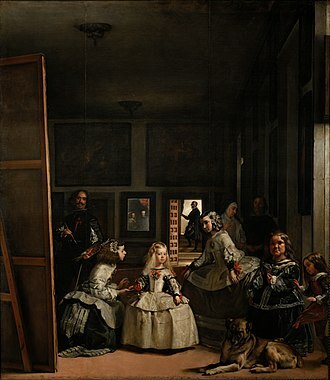 ^ Real de a Ocho (1621–1700), Portal Fuenterrebollo. Retrieved on 20 March 2008 (in Spanish) Information on the early coinage in Spanish America (and contemporary Spain). ^ Las casas de moneda españolas en América del sur Archived April 5, 2008, at the Wayback Machine.. Retrieved on 20 March 2008 (in Spanish) On-line book detailing the history of the Spanish mints in South America. Dargent Chamot, Eduardo. Las casas de moneda españolas en América del sur (in Spanish). Archived from the original on 5 April 2008. Retrieved 13 February 2015. On-line book detailing the history of the Spanish mints in South America. "Real de a Ocho (1621–1700), Portal Fuenterrebollo" (in Spanish). Retrieved 13 February 2015. Information on the early coinage in Spanish America (and contemporary Spain). Calbetó de Grau, Gabriel. 1970. Compendio de las Piezas de Ocho Reales. 2 volumes/tomos. San Juan, Puerto Rico: Ediciones Juan Ponce de León. Bischoff, William, editor 1989. The Coinage of El Perú, New York: American Numismatic Society. 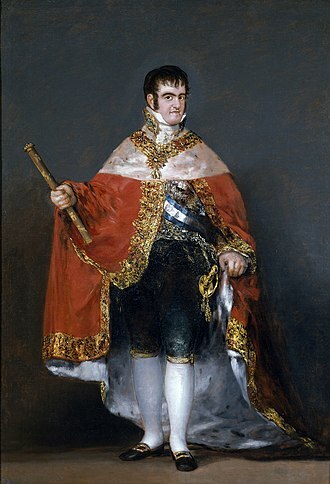 Charles IV was King of Spain from 14 December 1788, until his abdication on 19 March 1808. Charles was the son of Charles III and his wife. He was born in Naples, while his father was King of Naples and his elder brother, Don Felipe, was passed over for both thrones, due to his learning disabilities and epilepsy. 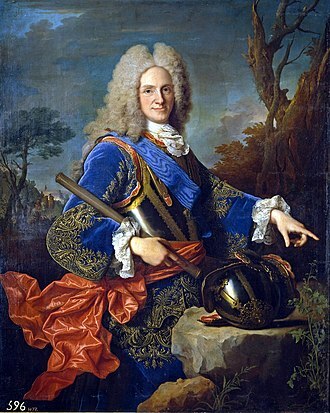 In Naples and Sicily, Charles was referred to as the Prince of Taranto and he was called El Cazador, due to his preference for sport and hunting, rather than dealing with affairs of the state. Charles was considered by many to have been amiable, but simple-minded, in 1788, Charles III died and Charles IV succeeded to the throne. He intended to maintain the policies of his father, and retained his prime minister, the Count of Floridablanca, in office. Even though he had a belief in the sanctity of his office. 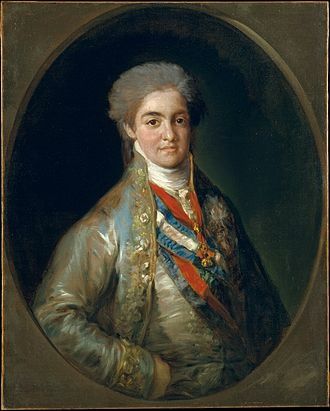 The affairs of government were left to his wife, Maria Luisa, in 1792, political and personal enemies ousted Floridablanca from office, replacing him with Pedro Pablo Abarca de Bolea, Count of Aranda. Humboldts Political Essay on the Kingdom of New Spain was a key publication from his five-year travels, Godoy continued Arandas policy of neutrality towards France, but after Spain protested the execution of Louis XVI of France, the deposed king, in 1793, France declared war on Spain. After the declaration and Spain signed a treaty of protection against France. 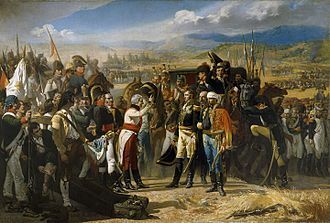 In 1795 France forced Godoy to enter into an alliance, Spain remained an ally of France and supported the Continental Blockade until the British naval victory at Trafalgar, when Spain became allied with Britain. 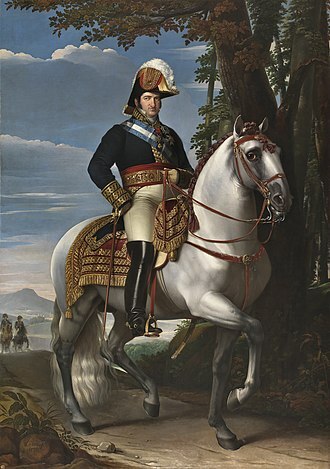 However, after Napoleons victory over Prussia in 1807, Godoy again steered Spain back onto the French side and this switching of alliances devalued Charles position as a trustworthy ally, increasing Godoys unpopularity, and strengthening the fernandistas, who favoured an alliance with the United Kingdom. Economic troubles, rumours about a relationship between the Queen and Godoy, and the Kings ineptitude, caused the monarchy to decline in prestige among the population. Burgos is a city in northern Spain and the historic capital of Castile. It is situated on the confluence of the Arlanzón river tributaries and it has about 180,000 inhabitants in the actual city and another 20,000 in the metropolitan area. It is the capital of the province of Burgos, in the community of Castile. A large number of churches and other buildings from the medieval age remain, the city is surrounded by the Fuentes Blancas and the Paseo de la Isla parks. The city forms the principal crossroad of northern Spain along the Camino de Santiago and it has a well-developed transportation system, forming the main communication node in northern Spain. In 2008, the international Burgos Airport started to offer commercial flights, furthermore, AVE high speed trains are planned to start service in the near future, stopping at the newly-built Rosa de Lima train station. The Museum of Human Evolution was opened in 2010, unique in its kind across the world, the museum features the first Europeans, which lived in this area 800,000 years ago. Burgos was selected as the Spanish Gastronomy Capital of 2013, there are several possible origins for the toponymy. When the city was founded, the inhabitants of the country moved into the fortified village. The city began to be called Caput Castellae, early humans occupied sites around Burgos as early as 800,000 years ago. When the Romans took possession of what is now the province of Burgos, in Roman times, it belonged to Hispania Citerior and to Hispania Tarraconensis. The region came to be known as Castile, i. e. land of castles, the city began to be called Caput Castellae. 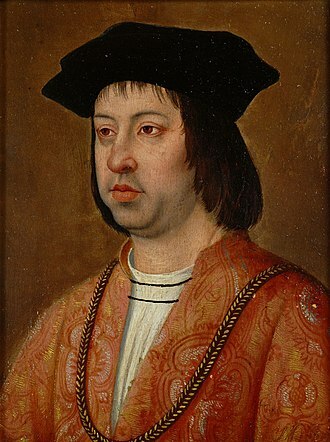 The county of Burgos, subject to the Kings of León, continued to be governed by counts and was extended, one of these counts, Fernán González. In the 11th century, the city became the see of the Roman Catholic Diocese of Burgos, throughout the 13th and 14th centuries, Burgos was a favourite seat of the kings of León and Castile and a favoured burial site. In 1285, Sancho IV added a new body to the consejo which came to dominate it, the jurado in charge of collecting taxes and overseeing public works, the alguacil was the royal official instituted to judge disagreements. The Viceroyalty of Peru was a Spanish colonial administrative district, created in 1542, that originally contained most of Spanish-ruled South America, governed from the capital of Lima. The Viceroyalty of Peru was one of the two Spanish Viceroyalties in the Americas from the sixteenth to the eighteenth centuries, the Spanish did not resist the Portuguese expansion of Brazil across the meridian established by the Treaty of Tordesillas. The treaty was rendered meaningless between 1580 and 1640 while Spain controlled Portugal, the viceroyalty would dissolve, as with much of the Spanish empire, when challenged by national independence movements at the beginning of the nineteenth century. From September 2,1564 to November 26,1569 he was viceroy of Peru. In 1542, the Spanish created the Viceroyalty of New Castile, in 1544, Holy Roman Emperor Charles V named Blasco Núñez Vela Perus first viceroy, but the viceroyalty was not organized until the arrival of Viceroy Francisco Álvarez de Toledo. Toledo made a tour of inspection of the colony. He improved the safety in the viceroyalty with fortifications, still, Luis Jerónimo de Cabrera, 4th Count of Chinchón sent out the third expedition to explore the Amazon River, under Cristóbal de Acuña. Many Pacific islands were visited by Spanish ships in the sixteenth century and these included New Guinea, and the Solomon Islands and the Marquesas Islands by Álvaro de Mendaña de Neira. These groups had the advantage of remote geography and river access from the mouth of the Amazon, the Spanish were barred by their laws from slaving of indigenous people, leaving them without a commercial interest deep in the interior of the basin. One famous attack upon a Spanish mission in 1628 resulted in the enslavement of 60,000 indigenous people, in fact as time passed they were used as a self funding occupation force by the Portuguese authorities in what was effectively a low level war of territorial conquest. In 1617, Francisco de Borja y Aragón divided the government of Río de la Plata into two, Buenos Aires and Paraguay, both dependencies of the Viceroyalty of Peru. 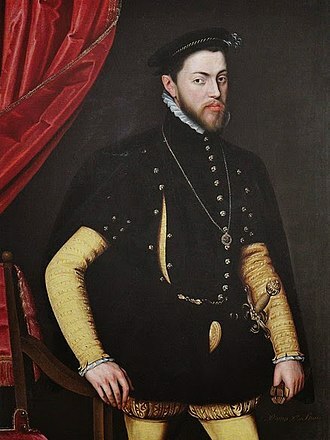 Viceroy Borja y Aragón established the Tribunal del Consulado, a special court, Diego Fernández de Córdoba, Marquis of Guadalcázar reformed the fiscal system and stopped the interfamily rivalry that was bloodying the domain. 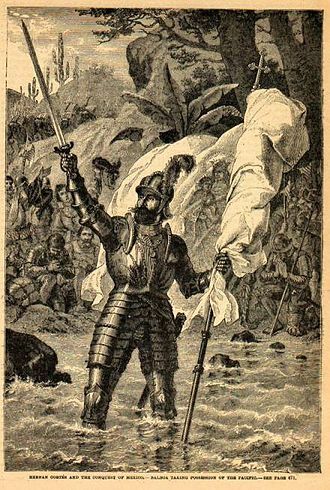 Fernández de Cabrera suppressed an insurrection of the Uru and Mapuche Indians, viceroys had to protect the Pacific coast from French contraband and English and Dutch pirates. They expanded the naval forces, fortified the ports of Valdivia, Valparaíso, Arica and Callao and constructed city walls in Lima, the famous English privateer Henry Morgan took Chagres and captured and sacked the city of Panama in the early part of 1670. Also Peruvian forces repelled the attacks by Edward David, Charles Wager, the Peace of Utrecht allowed the British to send ships and merchandise to the fair at Portobello. In this period, revolts were common, around 1656, Pedro Bohórquez crowned himself Inca of the Calchaquí Indians, inciting the indigenous population to revolt. From 1665 until 1668, the rich mineowners José and Gaspar Salcedo revolted against the colonial government, the clergy were opposed to the nomination of prelates from Spain. Its purpose was to correspond to the German thaler. The Spanish dollar was used by many countries as the first international currency because of its uniformity in standard. Some countries countersigned the Spanish dollar so it could be used as their local currency, the Spanish dollar was the coin upon which the original United States dollar was based, and it remained legal tender in the United States until the Coinage Act of 1857. 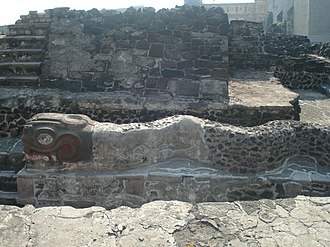 Because it was used in Europe, the Americas. Diverse theories link the origin of the $ symbol to the columns, millions of Spanish dollars were minted over the course of several centuries. They were among the most widely circulating coins of the period in the Americas. In the 16th century, Count Hieronymus Schlick of Bohemia began minting coins known as Joachimsthalers, named for Joachimsthal, the Joachimsthalers weighed 451 Troy grains of silver. So successful were these coins that similar thalers were minted in Burgundy, the Burgundian Cross Thaler depicted the Cross of Burgundy and was prevalent in the Burgundian Netherlands that were revolting against the Spanish king and Duke of Burgundy Philip II. After 1575, the Dutch revolting provinces replaced the currency with a daalder depicting a lion, specifically to facilitate export trade, the leeuwendaalder was authorized to contain 427.16 grains of.750 fine silver, lighter than the large denomination coins in circulation. Clearly it was advantageous for a Dutch merchant to pay a foreign debt in leeuwendaalders rather than in other heavier. Thus, the leeuwendaalder or lion dollar became the coin of choice for foreign trade and it became popular in the Middle East, and colonies in the east and west. They circulated throughout the English colonies during the Seventeenth and early Eighteenth centuries, from New Netherland the lion dollar spread to all thirteen colonies in the west. After the introduction of the Guldengroschen in Austria in 1486, the concept of a silver coin with high purity eventually spread throughout the rest of Europe. Monetary reform in Spain brought about the introduction of an 8-real coin in 1497, in 1537 the Spanish escudo gold coin was introduced, which was worth 16 reales. Charles V was ruler of both the Spanish Empire from 1516 and the Holy Roman Empire from 1519, as well as of the Habsburg Netherlands from 1506. He voluntarily stepped down from these and other positions by a series of abdications between 1554 and 1556, through inheritance, he brought together under his rule extensive territories in western and southern Europe, and the Spanish colonies in the Americas and Asia. As a result, his domains spanned nearly four square kilometers and were the first to be described as the empire on which the sun never sets. Charles was the heir of three of Europes leading dynasties, the Houses of Valois-Burgundy and Trastámara and he inherited the Burgundian Netherlands and the Franche-Comté as heir of the House of Valois-Burgundy. From his own dynasty, the Habsburgs, he inherited Austria and he was elected to succeed his Habsburg grandfather, Maximilian I, as Holy Roman Emperor, a title held by the Habsburgs since 1440. Charles was the first king to rule Castile and Aragon simultaneously in his own right, the personal union, under Charles, of the Holy Roman Empire with the Spanish Empire resulted in the closest Europe would come to a universal monarchy since the death of Louis the Pious. France recovered and the wars continued for the remainder of Charless reign, enormously expensive, they led to the development of the first modern professional army in Europe, the Tercios. The struggle with the Ottoman Empire was fought in Hungary and the Mediterranean, after seizing most of eastern and central Hungary in 1526, the Ottomans’ advance was halted at their failed Siege of Vienna in 1529. A lengthy war of attrition, conducted on his behalf by his younger brother Ferdinand, in the Mediterranean, although there were some successes, Charles was unable to prevent the Ottomans’ increasing naval dominance and the piratical activity of the Barbary Corsairs. Charles opposed the Reformation and in Germany he was in conflict with the Protestant Princes of the Schmalkaldic League who were motivated by religious and political opposition to him. Once the rebellions were quelled the essential Castilian and Burgundian territories remained mostly loyal to Charles throughout his rule, Charles’s Spanish dominions were the chief source of his power and wealth, and they became increasingly important as his reign progressed. In the Americas, Charles sanctioned the conquest by Castillian conquistadors of the Aztec, Castillian control was extended across much of South and Central America. The resulting vast expansion of territory and the flows of South American silver to Castile had profound long term effects on Spain. Charles was only 56 when he abdicated, but after 34 years of rule he was physically exhausted and sought the peace of a monastery. Upon Charles’s abdications, the Holy Roman Empire was inherited by his younger brother Ferdinand, the Spanish Empire, including the possessions in the Netherlands and Italy, was inherited by Charles’s son Philip II. 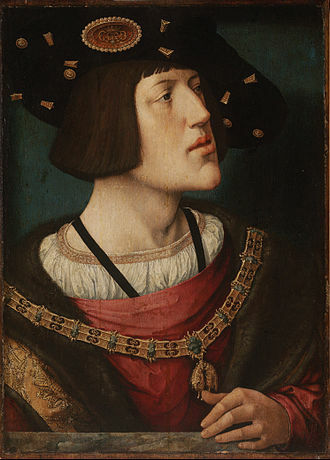 The two empires would remain allies until the 18th century, Charles was born in 1500 as the eldest son of Philip the Handsome and Joanna of Castile in the Flemish city of Ghent, which was part of the Habsburg Netherlands. 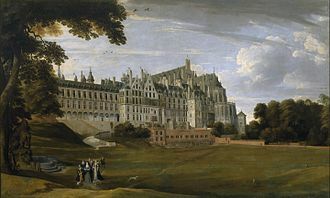 The culture and courtly life of the Burgundian Low Countries were an important influence in his early life and he was tutored by William de Croÿ, and by Adrian of Utrecht. Hispaniola is the 22nd-largest island in the world, located in the Caribbean island group, the Greater Antilles. It is the second largest island in the Caribbean after Cuba, two sovereign nations share the 76, 192-square-kilometre island. The only other shared island in the Caribbean is Saint Martin, Hispaniola is the site of the first permanent European settlement in the Americas, founded by Christopher Columbus on his voyages in 1492 and 1493. The island was called by various names by its native people, fernández de Oviedo and de las Casas both recorded that the island was called Haiti by the Taíno. DAnghiera added another name, but shows that the word does not seem to derive from the original Arawak Taíno language. When Columbus took possession of the island in 1492, he named it Insula Hispana, meaning the Spanish Island in Latin and La Isla Española, meaning the Spanish Island, in Spanish. De las Casas shortened the name to Española, and when d‘Anghiera detailed his account of the island in Latin, he rendered its name as Hispaniola. Due to Taíno, Spanish and French influences on the island, historically the whole island was referred to as Haiti, Santo Domingo, St. Domingue. The name Haïti was adopted by Haitian revolutionary Jean-Jacques Dessalines in 1804, as the name of independent Saint-Domingue. It was adopted as the name of independent Santo Domingo, as the Republic of Spanish Haiti. Christopher Columbus inadvertently landed on the island during his first voyage across the Atlantic in 1492, where his flagship, a contingent of men were left at an outpost christened La Navidad, on the north coast of present-day Haiti. The island was inhabited by the Taíno, one of the indigenous Arawak peoples, the Taino were at first tolerant of Columbus and his crew, and helped him to construct La Navidad on what is now Môle-Saint-Nicolas, Haiti, in December 1492. European colonization of the began in earnest the following year. In 1496 the town of Nueva Isabela was founded, after being destroyed by a hurricane, it was rebuilt on the opposite side of the Ozama River and called Santo Domingo. Santo Domingo, officially Santo Domingo de Guzmán, is the capital and largest city in the Dominican Republic and the largest metropolitan area in the Caribbean by population. In 2010, its population was counted as 965,040, the city is coterminous with the boundaries of the Distrito Nacional, itself bordered on three sides by Santo Domingo Province. Santo Domingo is the site of the first university, castle, the citys Colonial Zone was declared as a World Heritage Site by UNESCO. 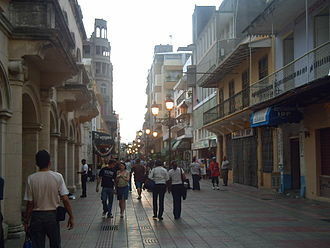 Santo Domingo was called Ciudad Trujillo, from 1936 to 1961, after the Dominican Republics dictator, Rafael Trujillo, following his assassination, the city resumed its original designation. Santo Domingo is the cultural, political and industrial center of the Dominican Republic, Santo Domingo serves as the chief seaport of the country. The citys harbor at the mouth of the Ozama River accommodates the largest vessels, temperatures are high year round, with a cool breeze around winter time. At the time, the territory consisted of five chiefdoms, Marién, Maguá, Jaragua. These were ruled respectively by caciques Guacanagarix, Caonabo, Bohechío, dating from 1496, when the Spanish settled on the island, and officially from 5 August 1498, Santo Domingo became the oldest European city in the Americas. Bartholomew Columbus founded the settlement and named it La Nueva Isabela, in 1495 it was renamed Santo Domingo, in honor of Saint Dominic. Santo Domingo came to be known as the Gateway to the Caribbean, in June 1502, Santo Domingo was destroyed by a major hurricane, and the new Governor Nicolás de Ovando had it rebuilt on a different site on the other side of the Ozama River. The original layout of the city and a portion of its defensive wall can still be appreciated today throughout the Colonial Zone. Diego Colon arrived in 1509, assuming the powers of Viceroy, in 1512, Ferdinand established a Real Audiencia with Juan Ortiz de Matienzo, Marcelo de Villalobos, and Lucas Vazquez de Ayllon appointed as judges of appeal. In 1514, Pedro Ibanez de Ibarra arrived with the Laws of Burgos, rodrigo de Alburquerque was named repartidor de indios and soon named visitadores to enforce the laws. Joanna of Castile, called the Mad, was queen of Castile from 1504 and of Aragon from 1516. From the union of two crowns modern Spain evolved. Joanna married Philip the Handsome on 20 October 1496, Philip was crowned King of Castile in 1506, initiating the rule of the Habsburgs in Spain. After Philips death that year, Joanna was deemed mentally ill and was confined to a nunnery for the rest of her life. Though she remained the legal queen of Castile throughout this time, her father, Ferdinand II of Aragon, was regent until his death, from 1517, her son, ruled as king, while she nominally remained co-monarch. 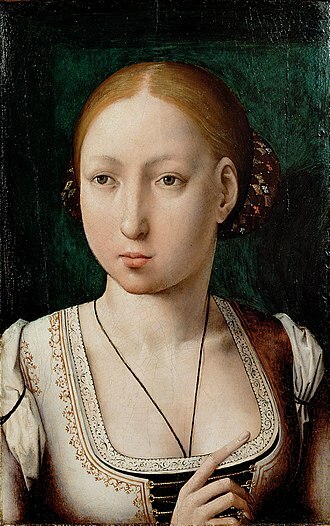 Joanna was born in the city of Toledo, the capital of the Kingdom of Castile and she was the third child and second daughter of Isabella I of Castile and Ferdinand II of Aragon of the royal House of Trastámara. Joanna was a clever and diligent child and an excellent student, Queen Isabella ensured that Joanna, along with her three sisters Isabella and Catherine, received a fine education. Her academic education consisted of canon and civil law and heraldry, history, mathematics, reading and writing. In the Castilian court her main tutors were the Dominican priest Andrés de Miranda, the respected educator Beatriz Galindo who was a member of the queens court, and her mother the queen. Joanna developed feminine accomplishments in court etiquette, drawing, equestrian skills, good manners and the arts of embroidery, needlepoint. She excelled in all of the Iberian Romance languages, Leonese, Galician-Portuguese, Joanna was given instruction in religious studies and she learned outdoor pursuits such as hawking and hunting. Praise was given to her for being a dancer and a talented musician, she played the clavichord, the guitar. 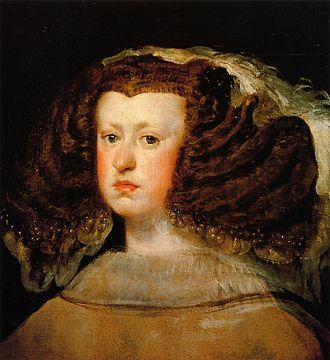 As an infanta she was not expected to be heiress to the throne of either Castile or Aragon and she had a fair complexion, blue eyes and her hair colour was between strawberry-blonde and auburn, like her mother and sister Catherine. Already in 1495 Joanna showed signs of religious skepticism and little devotion to worship and this alarmed her mother, who ordered it to be kept secret. New Spain was a colonial territory of the Spanish Empire, in the New World north of the Isthmus of Panama. 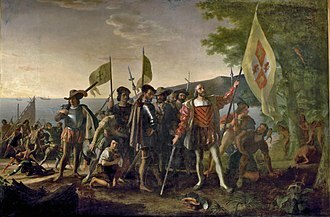 It was established following the Spanish conquest of the Aztec Empire in 1521, after 1535 the colony was governed by the Viceroy of New Spain, an appointed minister of the King of Spain, who ruled as monarch over the colony. The capital of New Spain was Mexico City and it developed highly regional divisions, which reflect the impact of climate, the presence or absence of dense indigenous populations, and the presence or absence of mineral resources. The areas of central and southern Mexico had dense indigenous populations with complex social, silver mining not only became the engine of the economy of New Spain, but vastly enriched Spain, and transformed the global economy. New Spain was the New World terminus of the Philippine trade, although New Spain was a dependency of Spain, it was a kingdom not a colony, subject to the presiding monarch on the Iberian Peninsula. Every privilege and position, economic political, or religious came from him and it was on this basis that the conquest and government of the New World was achieved. The Viceroyalty of New Spain was established in 1535 in the Kingdom of New Spain and it was the first New World viceroyalty and one of only two in the Spanish empire until the 18th century Bourbon Reforms. The Spanish Empire comprised the territories in the north overseas Septentrion, from North America, to the west of the continent, New Spain included the Spanish East Indies. To the east of the continent, it included the Spanish West Indies and this was not occupied by many Spanish settlers and were considered more marginal to Spanish interests than the most densely populated and lucrative areas of central Mexico. To shore up its claims in North America starting in the late 18th century, Spanish expeditions to the Pacific Northwest explored and claimed the coast of what is now British Columbia and Alaska. The indigenous societies of Mesoamerica brought under Spanish control were of unprecedented complexity, the societies could provide the conquistadors, especially Hernán Cortés, a base from which the conquerors could become autonomous, or even independent, of the Crown. As a result, the Holy Roman Emperor and King of Spain, since the time of the Catholic Monarchs, central Iberia was governed through councils appointed by the monarch with particular jurisdictions. Thus, the creation of the Council of the Indies became another, the crown had set up the Casa de Contratación in 1503 to regulate contacts between Spain and its overseas possessions. A key function was to gather information about navigation to make trips less risky and they were accompanied by maps of the area discussed, many of which were drawn by indigenous artists. The Francisco Hernández Expedition, the first scientific expedition to the New World, was sent to gather information medicinal plants, an earlier Audiencia had been established in Santo Domingo in 1526 to deal with the Caribbean settlements. That Audiencia, housed in the Casa Reales in Santo Domingo, was charged with encouraging further exploration, management by the Audiencia, which was expected to make executive decisions as a body, proved unwieldy. The Catholic Monarchs is the joint title used in history for Queen Isabella I of Castile and King Ferdinand II of Aragon. 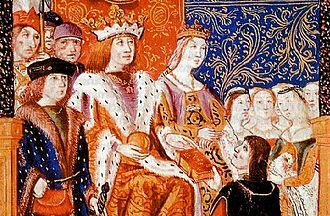 They married on October 19,1469, in the city of Valladolid, Isabella was eighteen years old and it is generally accepted by most scholars that the unification of Spain can essentially be traced back to the marriage of Ferdinand and Isabella. The court of Ferdinand and Isabella was constantly on the move, the title of Catholic King and Queen was bestowed on Ferdinand and Isabella by Pope Alexander VI in 1494, in recognition of their defence of the Catholic faith within their realms. Catholic monarchs or kings can be used in a generic sense, Isabella was named heir to the throne of Castile by her half brother Henry IV of Castile in the Treaty of the Bulls of Guisando. She became Queen of Castile in 1474 and her niece, Joanna of Castile, attempted to gain the throne by bringing in the foreign help of Afonso V of Portugal, leading to the War of Castilian Succession. More recently, some speculate that Joanna was the legitimate successor, Isabellas supporters came out ahead in good part due to Aragons support through Ferdinand, and she officially won in 1479 via the Treaty of Alcáçovas. 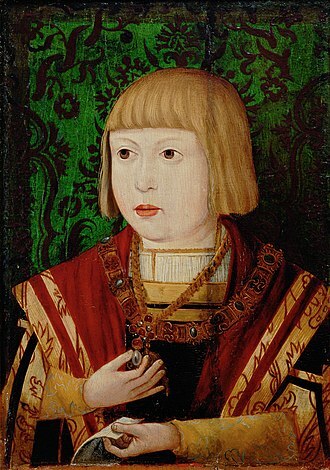 Ferdinand became the King of Aragon in 1479, the Catholic Monarchs set out to restore royal authority in Spain. 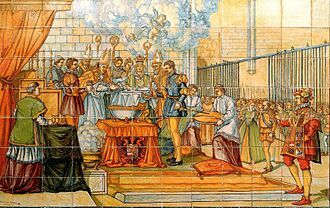 To accomplish their goal, they first created a group named the Holy Brotherhood and these men were used as a judicial police force for Castile, as well as to attempt to keep Castilian nobles in check. To establish a more uniform system, the Catholic Monarchs created the Royal Council. This establishment of authority is known as the Pacification of Castile. Even after his death and the union of the crowns under one monarch, the Aragonese, further, the monarchs continued ruling through a form of medieval contractualism, which made their rule pre-modern in a few ways. One of those is that they traveled from town to town throughout the kingdom in order to promote loyalty, another is that each community and region was connected to them via loyalty to the crown, rather than bureaucratic ties. Ferdinand and Isabella were noted for being the monarchs of the newly united Spain at the dawn of the modern era and they had a goal of conquering the Muslim kingdom of Granada and completing the Christian reconquest of the Iberian Peninsula. Sebastián Francisco de Miranda y Rodríguez de Espinoza, commonly known as Francisco de Miranda, was a military leader and Venezuelan revolutionary. Miranda led a romantic and adventurous life in the political and intellectual climate that emerged from the Age of Enlightenment that influenced all of the Atlantic Revolutions. He participated in three major historical and political movements of his time, the American Revolutionary War, the French Revolution and he described his experiences over this time in his journal, which reached to 63 bound volumes. An idealist, he developed a plan to liberate and unify all of Spanish America. He was handed over to his enemies and four years later, Miranda was born in Caracas, Venezuela Province, in the Spanish colonial Viceroyalty of New Granada, and baptized on April 5,1750. Growing up, Miranda enjoyed a wealthy upbringing and attended the finest private schools, however, he was not necessarily a member of high society, he faced some discrimination due to his Canarian roots, and his heritage was continually put into question by the Criollo aristocracy. Miranda was first tutored by Jesuits, Jorge Lindo and Juan Santaella, on January 10,1762, Miranda began his studies at the Royal and Pontifical University of Caracas, where he studied Latin, the early grammar of Nebrija, and the Catechism of Ripalda for two years. Miranda completed this course in September 1764 and became an upperclassman. Between 1764 and 1766, Miranda continued his studies, studying the writings of Cicero and Virgil, history, geography, in June 1767, Miranda received his baccalaureate degree in the Humanities. It is unknown if Miranda received the title of Doctor, as the evidence in favor of this title is his personal testimony stating he received it in 1767. Beginning in 1767, Mirandas studies were disrupted in part due to his fathers rising prominence in Caracas society. In 1764, Sebastian de Miranda was appointed the captain of the militia known as the Company of the White Canary Islanders by the governor. Sebastian de Miranda directed his regiment for five years, but his new title, in retaliation, a competing faction formed a militia of its own and two local aristocrats, Don Juan Nicolas de Ponte and Don Martin Tovar Blanco, filed a complaint against Sebastian de Miranda. Juan Ponce de León (Santervás de Campos, Valladolid, Spain) led the first European expedition to Florida, which he named. Nueva Caceres, one of the cities of Las Islas Filipinas., Spanish East Indies. 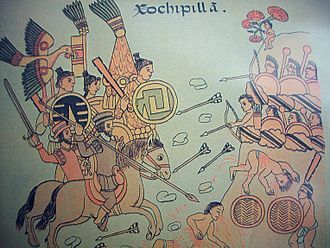 Viceroy don Antonio de Mendoza and Tlaxcalan Indians battle with the Caxcanes in the Mixtón war, 1541-42 in Nueva Galicia. The First Chilean Navy Squadron (in picture) made the 1820 Freedom Expedition of Perú possible. Chilean involvement in Peru's independence would later cause disputes over war debts. Ferdinand on the left with Isabella on the right. The inscription above identifies them as "Lord Ferdinand and Lady Isabella, Monarchs of Castile and of Aragon". Virgin of the Catholic Monarchs, (painted ca. 1491-1493). 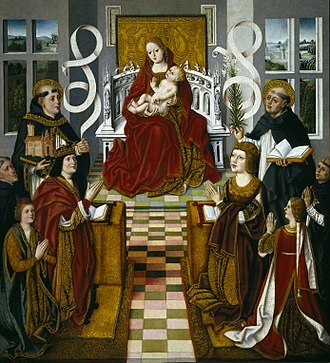 The Virgin Mary (center), with St Thomas Aquinas symbolically holding the Catholic Church and St Domingo de Guzmán, Spanish founder of the Dominican Order, with a book and a palm frond. Ferdinand is with the prince of Asturias and the inquisitor; Isabella with their daughter, Isabel de Aragón. 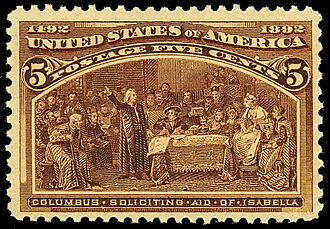 Columbus soliciting aid of Ferdinand's wife Isabella. 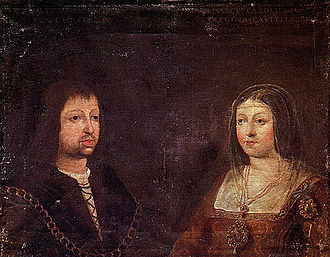 Wedding portrait of King Ferdinand II of Aragón and Queen Isabella of Castile. La Casa Blanca, country mansion of Rodrigo de Dueñas, built in the 16th century. Front view of Castle of La Mota. Silver 8-real coin of 1768 from the Potosí mint. Silver real coined in Seville during the reign of Peter I of Castile (1350-1369). The marriage contract of Joanna and Philip (1496). Ruins of the Castle of Burgos, of a possible Visigothic origin. Abbey of Santa María la Real de Las Huelgas, founded in 1180. 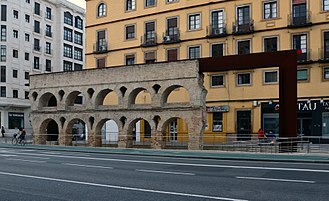 14th-century city gate Arco de Santa María. French-styled architecture in Benito Juárez, Mexico City, whose architectural legacy remains in the neighborhoods of Condesa, Zona Rosa, Centro Historico and Chapultepec. The European Pillar of Hercules: the Rock of Gibraltar (foreground), with the North African shore in the background. Jebel Musa, one of the candidates for the North African Pillar of Hercules, as seen from Tarifa, at the other shore of the Strait of Gibraltar. Modern conjectural depiction of the lost western section of the Tabula Peutingeriana, showing a representation of the Pillars of Hercules (Columne Ercole). 'The Baptism of Phillip II' in Valladolid, Spain. Historical ceiling preserved in Palacio de Pimentel (Valladolid). The Manila-Acapulco Galleon Memorial at Plaza Mexico in Intramuros, Manila. Obverse CAROLUS III DEI GRATIA 1776 "Charles III by the Grace of God, 1776" Right profile of Charles III in toga with laurel wreath. Obverse CAROLUS IIII DEI GRATIA 1806 "Charles IV by the Grace of God, 1806." Right profile of Charles IV in soldier's dress with laurel wreath. It was under the reign of this monarch that the United States Mint began the U.S. silver dollar in 1794. Ambrosio Spinola, one of Philip III's various imperial proconsuls, by Peter Paul Rubens. Mateo Alemán, an early modern novelist who recorded the terrible 'plague that came down from Castile and the famine that rose from Andalusia' to cripple Philip III's domestic economy. 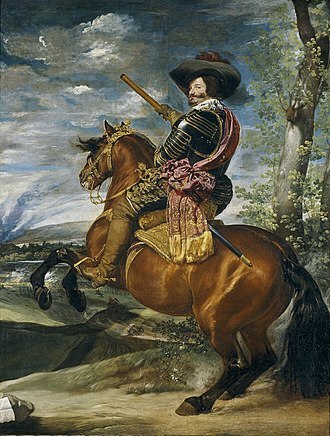 Philip IV at the height of his success, painted c. 1631-2 by Diego Velázquez. Philip dressed as a cuirassier, accompanied by a court dwarf, by Gaspar de Crayer. Tomb of Philip V and Elizabeth Farnese in the Collegiate Church of the Holy Trinity, in the Royal Palace of La Granja de San Ildefonso (Segovia). Manuel Tolsá's large equestrian statue of Charles IV of Spain, Mexico City. Portuguese and British troops fighting the French at Vimeiro. Painting of Miranda by an unknown Incan author. 1806.